A new MIT plane is propelled via ionic wind. Batteries in the fuselage (tan compartment in front of plane) supply voltage to electrodes (blue/white horizontal lines) strung along the length of the plane, generating a wind of ions that propels the plane forward. Since the first airplane took flight over 100 years ago, virtually every aircraft in the sky has flown with the help of moving parts such as propellers, turbine blades, and fans, which are powered by the combustion of fossil fuels or by battery packs that produce a persistent, whining buzz. 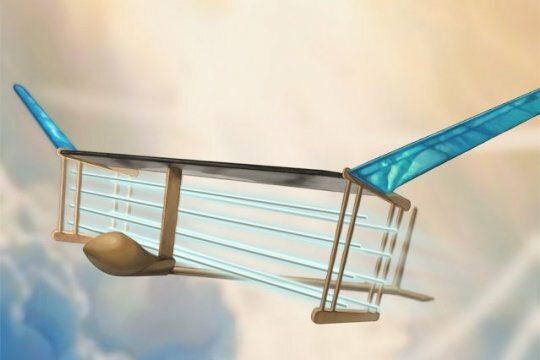 Now MIT engineers have built and flown the first-ever plane with no moving parts. Instead of propellers or turbines, the light aircraft is powered by an "ionic wind" -- a silent but mighty flow of ions that is produced aboard the plane, and that generates enough thrust to propel the plane over a sustained, steady flight. Unlike turbine-powered planes, the aircraft does not depend on fossil fuels to fly. And unlike propeller-driven drones, the new design is completely silent. "This is the first-ever sustained flight of a plane with no moving parts in the propulsion system," says Steven Barrett, associate professor of aeronautics and astronautics at MIT. "This has potentially opened new and unexplored possibilities for aircraft which are quieter, mechanically simpler, and do not emit combustion emissions." He expects that in the near-term, such ion wind propulsion systems could be used to fly less noisy drones. Further out, he envisions ion propulsion paired with more conventional combustion systems to create more fuel-efficient, hybrid passenger planes and other large aircraft. Barrett and his team at MIT have published their results in the journal Nature. Barrett says the inspiration for the team's ion plane comes partly from the movie and television series, "Star Trek," which he watched avidly as a kid. He was particularly drawn to the futuristic shuttlecrafts that effortlessly skimmed through the air, with seemingly no moving parts and hardly any noise or exhaust. "This made me think, in the long-term future, planes shouldn't have propellers and turbines," Barrett says. "They should be more like the shuttles in 'Star Trek,' that have just a blue glow and silently glide." About nine years ago, Barrett started looking for ways to design a propulsion system for planes with no moving parts. He eventually came upon "ionic wind," also known as electroaerodynamic thrust -- a physical principle that was first identified in the 1920s and describes a wind, or thrust, that can be produced when a current is passed between a thin and a thick electrode. If enough voltage is applied, the air in between the electrodes can produce enough thrust to propel a small aircraft. For years, electroaerodynamic thrust has mostly been a hobbyist's project, and designs have for the most part been limited to small, desktop "lifters" tethered to large voltage supplies that create just enough wind for a small craft to hover briefly in the air. It was largely assumed that it would be impossible to produce enough ionic wind to propel a larger aircraft over a sustained flight. "It was a sleepless night in a hotel when I was jet-lagged, and I was thinking about this and started searching for ways it could be done," he recalls. "I did some back-of-the-envelope calculations and found that, yes, it might become a viable propulsion system," Barrett says. "And it turned out it needed many years of work to get from that to a first test flight."